Kasha Ki Aasha welcomes Maneli Jamal this Saturday! Kasha Ki Aasha continues its Purely Pondicherry Performance Series with Maneli Jamal, an acclaimed acoustic guitarist based in Canada this Saturday evening at 8 pm. 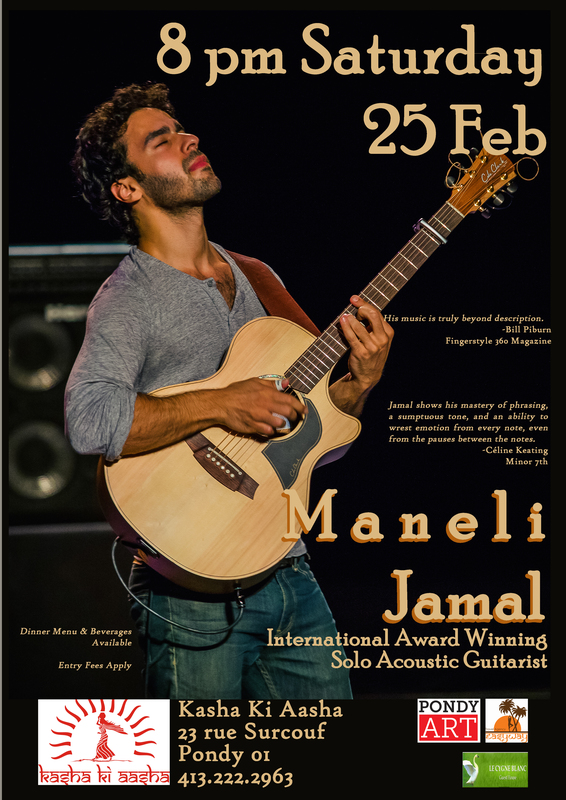 Acoustic guitarist Maneli Jamal has lived in five different countries (Iran, Belarus, Germany, USA, Canada) and moved twenty times by the time he was 18. The young artist gained a sense of musical maturity rarely seen among his peers especially when he transforms his nomadic life experiences into musical movements using extended guitar techniques. There aren’t many players in his style that have Jamal’s balance of power and sensitivity, nor his breadth of ideas. His rhythmic concepts can be alternately short and dense, or explored carefully through several movements and real life stories. This becomes evident with having won countless music competitions around the world including most recently placing 1st at Canada’s Soundclash Music Awards. Having been brought up in a purely artistic and musical family has contributed to shape his unique and comical story telling approach in live settings. He has performed in 5 continents and 15 countries as a solo performer, has a signature model acoustic guitar named after him and was on the front cover of 2015 Toronto magazine (500,000 copies distributed worldwide). The world is his home and he plays from one end to the other. For a preview of this weekend’s performance, check out Maneli’s website!